A deadly new strain of the fungus known as Panama Disease threatens the world's banana supply. Bananas as we know them may be at serious risk. According to a report from the Washington Post, a fungus called Panama Disease is threatening the strain of bananas that are sold in markets around the world. In the mid 20th century, the Gros Michel was the most popular variety of banana in the world. Panama Disease first arose in Australia in the 19th century, before making its way across the ocean and rendering banana trees in the western hemisphere useless. The supply of bananas was replaced by a new variety, the Cavendish. The Cavendish accounted for 99 percent of the international banana market, but it has recently come under threat by a new strain of the deadly Panama Disease. According to a new study from researchers at the Wageningen University and Research Center published in the journal PLOS One, banana plants all over the world are dying for the same reason they did decades ago. The new strain of the disease, which originated in Southeast Asia roughly 50 years ago, has made its way to Africa, the Middle East, Australia, and other parts of Asia. Scientists warn that it’s only a matter of time before the fungus makes its way to bananas in Latin America. 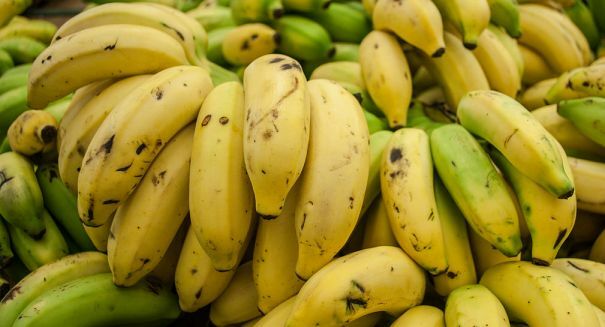 The reason this particular strain of the disease, named Tropical Race 4, is so deadly is that the vast majority of the bananas grown around the world are the same variety. They share the same vulnerability to the specific fungus, and the consequences of a widespread infection could be dire. The fungus has already wiped out one strain of commercially viable bananas. People born after the 1960s will rarely experience the taste of a Gros Michel, and the new strain of Panama Disease threatens to do the same for the Cavendish. The Cavendish was originally resistant to the strain of Panama Disease that wiped out the Gros Michel, but has fallen victim to the new strain of the fungus. By planting different varieties of bananas around the world, farmers could avoid widespread losses due to a specific strain of a disease that has been widely spread. Outlining the details of the study can be found here.